Starna Scientific, pioneers in the development of Certified Reference Materials (CRMs) for spectroscopy, offer the world’s most comprehensive range of materials for Instrument Qualification and performance evaluation. Manufactured and calibrated under strictly controlled conditions, these materials conform to all the relevant international standards and quality protocols. As a world leader in this technology, Starna has played a pivotal role in the development of CRMs for spectroscopy over many years, in close collaboration with international regulatory bodies and instrument manufacturers. 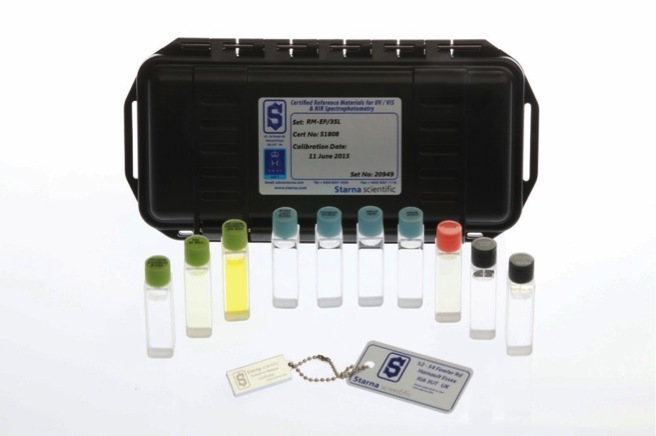 The range of Starna reference materials is continually expanding and includes references for ultraviolet and visible spectrophotometry, for fluorescence, NIR and Raman spectroscopy, references for use in plate readers and HPLC instrumentation, and a range of specialised materials for use in bioscience. References are also available in convenient sets for instrument qualification to the requirements of Pharmacopoeias and other regulatory bodies. The calibration of Starna Certified Reference Materials is traceable to international primary standards, allowing laboratories to demonstrate evidence of quality control according to ISO/IEC 17025, the universally recognised standard for laboratory accreditation. The Starna calibration laboratory was one of the first to be accredited to this standard, in 2001, and in 2006 Starna was further accredited to ISO 17034 (formerly ISO Guide 34) as a Reference Material Producer (RMP). Liquid references, including volatile and flammable materials, are permanently sealed by heat fusion into their cells. This process, developed by Starna, eliminates evaporation, improves stability and makes handling safer. Starna CRMs are covered by a lifetime guarantee. References can be re-certified and dispatched within five working days of receipt at the Starna calibration laboratory. Reference material sets can be customised to user requirements.